Home / Opinion and Issues/ Water for all! Muthun Murugaiya provides water for 15 families. The 60-year-old has the only working well in the neighbourhood in his front garden. Just feet away, the community well lies dry – groundwater is low in the village of Veemankamam in Sri Lanka’s Jaffna District. During the dry season there is a not a drop to be had. Muthun must pump water up for his neighbours, and he does this service happily and for free, only collecting a small sum to offset the electricity bills. Veemankamam village is made up entirely of recently resettled families. Muthun and his wife, 57-year-old Liladevi, are among them. They were displaced for 27 years, and when they returned home it was to find their land resembled a small jungle. When they moved in, Muthun dug his own well and hit an aquifer – an underground layer of permeable rock that held enough water to supply their needs. “It cost me Rs. 20,000 but it resolved our problems,” he says. However, his neighbours – many of whom have young children – were still struggling. “I was happy to help. I had only one condition which was that I could only pump water for them twice a day – between 7 a.m. and 8 a.m. and between 4 p.m. and 5 p.m. in the evening.” The water would help everyone meet their immediate needs for cooking and bathing. This was a boon – it only rains in these parts from October to November. The rest of the time, the skies are clear and the land dries up. His neighbour Vinod Kediswari says that before Muthun let her connect a line and tap to his well, she would have to walk to the local temple to get water. Again, it was only available once in the morning. She would come back balancing a water pot on one hip, and her young son Kaviwera on the other. Recognising how precious this resource was, Muthun and the community were chosen for support under the European Union (EU) funded Catalytic Support to Peacebuilding program in Sri Lanka. The €8.1 million, 18-month program is being implemented by the United Nations Children’s Fund (UNICEF), the United Nations Development Programme (UNDP), and the United Nations Human Settlements Programme (UN-Habitat) in partnership with a range of State and non-State partners. UNICEF became involved to help ensure the source of water remained steady and reliable. This entailed installing a modern aquifer recharging system. The water trapped in the rock could run dry, but it could be recharged or replenished by capturing rain water and storing it in the ground. This could be done through installing a recharge system in Muthun’s well itself. The water that comes pouring down during high-intensity storms doesn’t go to waste this way and is captured and put to the community’s use. 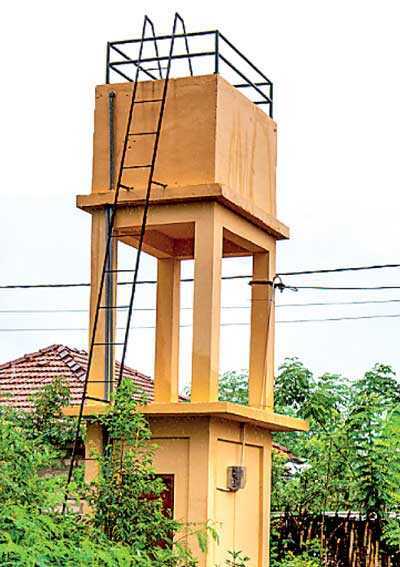 Yagaraja Nirosh, the Chairman of the Pradeshiya Sabha at Valikamam East, Puttur, thought that the Aquifer Management System was so essential that he had one installed on the grounds of the Pradeshiya Sabha itself. Some 75,000 people live in the area he oversees. “We need to supply over 851,000 litres of water to our families,” he says, explaining that the most common challenge in this area is saline intrusion from the nearby lagoon. During the dry season, water shortages exacerbate the problem. “Basically, this is a problem we are facing across the Jaffna peninsula,” he says. Nirosh decided to tackle the problem head on. “We wanted to ensure that our community had a sustainable source of water,” he says. They are considering making this official policy – asking every person constructing a house over 1,000 square feet to install an aquifer recharge system. Right now it’s a decision approved by their local council, but Nirosh would like to make it a by-law and is campaigning for it to be implemented across the province. Meanwhile, back in Veemankamam, Muthun is pleased to report that having to share water and negotiate its use has helped bring his neighbours closer together. “Now we are compelled to meet at least once a month,” he says with a laugh. The recharge system ensures that the water doesn’t run dry even during the dry season. He will soon be installing a rain water collection system on his roof as well. “I think this is our contribution to future generations, because the water may keep decreasing,” he says, pragmatically.